PT Adhi Karya (Persero) Tbk - ADHI was initiated on March 11, 1960 when the Minister of Public Works set Architecten-Ingenicure-en Annnemersbedrijf “Associatie Selle en de Bruyn, Reyerse en de Vries N.V” (Associatie N.V.), one of the Dutch-owned company that was nationalized into PN Adhi Karya. Nationalization was intended to spur infrastructure development in Indonesia. Adhi, the big construction company in Indonesia is inviting highly motivated professionals to fulfill this position. 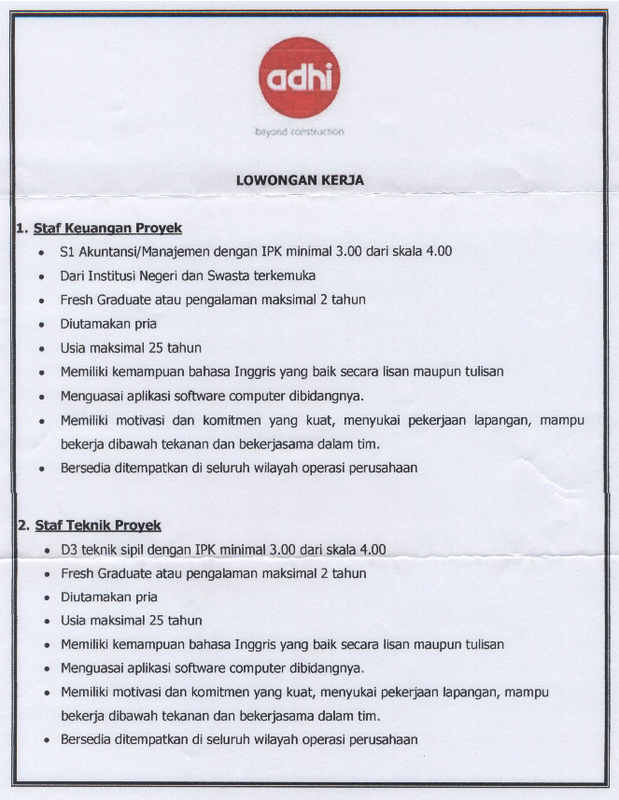 Should you interested, Potential and serious candidate, please send your complete application (legalized copy of diploma and transcript, copy of relevant certificates, 2 pieces of 4x6 color photograph) to Divisi Human Resources Capital (Bagian SDM), PT Adhi Karya (Persero) Tbk, Jl Raya Pasar Minggu Km 18 Jakarta 12510, Tlp. +62 21 797 5312 Fax. +62 21 797 5311 or at link below. Only short-listed candidates will be notified. Closing date : 6 July 2013.